In August, we posted a blog about the many varied options for pool decking material. Now that the summer season is coming to an end, The time for new pool or renovation season is about to start. Aqua Pool and Patio discuss the range of surface finish options available today that can define the overall aesthetic of your pool. Aggregate takes small pieces of different colored rocks and stones and mixes them with plaster for a finish that has both sparkle and texture. Available in polished or exposed options, aggregate can be mixed with many ranges of plaster colors for desired effect. Both options add traction and hardness making aggregate finishes more durable and long lasting than a normal plaster finish. They also tend to resist stains and the potential harshness of chemicals and therefore are a more maintenance friendly option. A plaster pool finish will always be a classic look. Most commonly showcased as a clean white plaster finish, this look complements any decking design or material and does a wonderful job of reflecting in-pool lighting for ambience when the sun has gone down. Also available in a range of color options used to either bring out the sparkling blue tone of the water on a cloudless sunny day, or to make the surface look more natural and reflective of the surrounding environment. 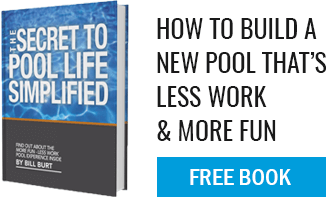 With so many pool finish options available, it is often difficult to sort through them all and decide what is right for you. Each offers a range of aesthetic qualities but they all also differ in hardness and durability. Do a little homework or feel free to get in touch and ask us for our opinion. We are glad to help.